A water infrastructure crisis looms in New Jersey's oldest and largest cities -- cities that comprise nearly one-fifth of the state's population and are projected to absorb much of its future growth, and yet have combined sewer systems, which carry both sewage and rainwater, dating to the 19th century. These combined sewers include overflow relief points that, during rain events, often result in combined sewer overflows (CSOs), which discharge raw sewage into waterways. These combined systems can also result in raw sewage backing up into city streets, parks and homes, threatening public safety and health. Of the nation's 860 communities plagued historically by CSOs, just 84 have yet to upgrade their systems or adopt plans to address the problem. Twenty-one of those 84 communities -- one-quarter -- are located in New Jersey. 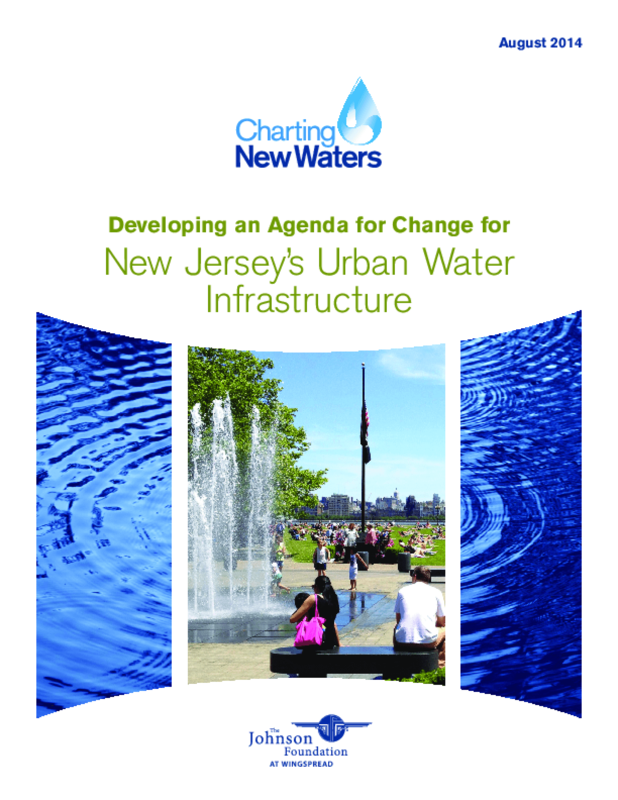 Urban water infrastructure challenges in New Jersey are not limited to the 21 cities with combined sewers. Even outside the CSO cities, polluted stormwater runoff is the state's leading threat to water quality. Many sanitary and separate storm sewer pipes and water-supply lines in the state are more than 100 years old and showing their age. The annual statewide loss (via leaks) of treated drinking water is estimated at 20 -- 22 percent, with some distribution systems losing as much as 45 percent. Water main breaks and resulting service outages are a common aspect of life in many cities. In addition, preexisting flooding problems are being exacerbated by more intense rainfall events driven by climate change, and such events are expected to become more frequent in the future. Most notably, in October 2012 Hurricane Sandy dramatically exposed the vulnerability of many of New Jersey's urban water systems to flooding and other storm damage. Collectively, the problems stemming from aging and degraded water-supply, wastewater and stormwater infrastructure threaten to disrupt daily life, commerce and industry in these communities, and stunt their future economic prosperity. this report, which elaborates upon the consensus document and presents The Johnson Foundation's synthesis of the broader range of information, insights and ideas shared during the convening. Copyright 2014 Charting New Waters, Geraldine R. Dodge Foundation, New Jersey Future, The Johnson Foundation at Wingspread.